At first it made me angry that nobody had written very much about this aspect of the Regency and then it made me very happy. I wrote two chapters of a book and sent it to Pen and Sword publishers, who agreed to publish. I was very fortunate that I had found one of the elusive “gaps in the market” that people need to get a book published. I had found a way of maintaining my interest in history after my retirement by writing about it rather than teaching. My focus is on the powerless, and the historic records do exist by the early nineteenth century. For the first time, the poor could make their voice heard without the landlord or the cleric looking over their shoulder. People like James Bilsham, rotting away in Aylsham House of Correction on a charge of grand larceny – that’s one shilling worth of goods. Or Thomas Holden, a Bolton weaver accused of conspiracy after forming a Trade Union because he refused to watch his family starve. Or Alice Kitchen, one of the first women to fight for the political right of women around the time of the Peterloo massacre. I sought them out and tried to tell their story, always aware that many of the sources could not be trusted to tell the truth. Some of my other subjects are slightly better known, but the real thrill was when, after hours of research, I came across a story about a person who had been totally forgotten. For a social historian like me, this is the greatest thing. It also exposes a weakness in me; I have no interest in the rich and only write about them when they are making the lives of others a misery. In my chapter “Cold Charity” I show how the rich helped the poor in the Regency period, but I question their motives. Sometimes all members of the country shared the same prejudices, and I have not shied away from that. My chapter on the prejudice against the Irish is an example of this. 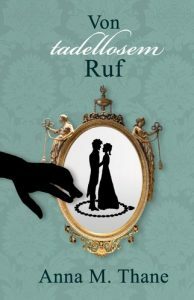 Is the truth about the Regency “Anti-Austen”? If you write a book about the “truth” of the Regency you risk the charge of being Anti-Austen. This is absolutely not the case. Even mediocre novelists are told to write “what they know”; great ones must do the same. Her genius would not be changed by cramming in a reference to bread prices or trade unionism; and, in the world that she knew, she was often quite a moralist herself. If Jane was able to read my book, I believe that her favourite chapters would be “All About The Money” where I show that Regency society was corrupt, rotten and cash was king, and my chapter on crim.con (adultery law cases) amongst the gentry and aristocracy. The second part of the book is the appalling behaviour of the ruling class. I am absolutely not interested in their fashions and habits, except their habit of grinding down the poor with laws designed to suit themselves. If this makes me sound a bit left wing, then that’s because that it is the truth. I generally accept Karl Marx’s view that the history of all hitherto existing societies is the history of class struggle, and I think Jane might have at least considered the notion. It’s not a left wing rant; I am history writer first and a “political animal” second. Some examples from the book: parliament decided to keep all the proceeds from the National Lottery to pay the interest on loans the rich had made to the government; they abolished income tax for the rich and put food taxes on the poor; the demobilised soldiers and sailors who had beaten Napoleon were left to starve. Poor law overseers kidnapped pregnant women and dragged them to the next parish to save money. I have two chapters on the Peterloo massacre of 1819. One deals with the radical women who became involved in politics for the first time, and the other is about the disgraceful cover up of the deaths of protestors. I am sorry that my book will not cheer you up. However, it’s not simply a matter of bad conditions and bad behaviour. I had another reason for writing this book. I am pretty frightened about the world now, and some of the comparisons with the Regency are unsettling. They lived in a time of climate disruption, caused (on this occasion) by a volcanic eruption in Indonesia and it did affect food supply and prices. I have a whole chapter, “Bread and Potatoes”, on the subject of diet. 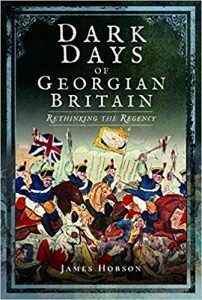 Technology was destroying jobs; the gap between the rich and the poor was widening and the rich were showing little concern about this – I deal with this in my chapter “The Disgusting Prince Regent”. I debated with myself for ages about putting a question mark at the end. The Regency welfare, legal and election system were rotten to the core. Ours seem to be in a similar state. It’s true that they were about to be reformed, but that was of little consolation to people at the time – to Kezia King, who took a job at Coldbath Fields prison which involved washing and physically restraining female prisoners and loved her job, as the alternative was picking oakum, unravelling ships ropes; to the inmates of Swansea workhouse, whose highlight of the week was cabbage soup; to James Poole, a hard working shopkeeper in London whose house was burgled – by the police. There is some light and shade in the book. We will never have a punishment system like the one described in the book, where owning the wrong type of dog could put you in prison; or the terrible treatment of gay men and women or the unsympathetic attitudes to mental health. But that’s about it; the times were dark. The weather was so bad in Europe and America in 1816 that this is not even a metaphor. The subtitle is Rethinking the Regency. I hope many of the people who focus the more pleasant side of the period will find the book interesting. No fingers are wagged, except at the uncaring rich; no heart strings are tugged on behalf of the poor. It is just a description of terrible times and the people who had the courage to fight back. Nothing could be more relevant today. 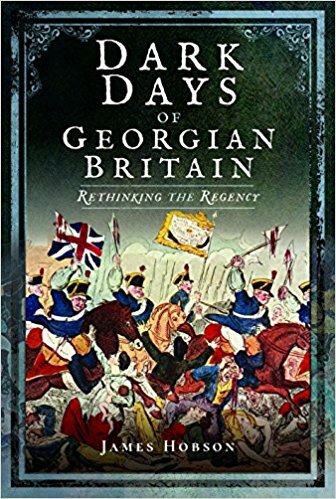 “The Dark Days of Georgian Britain” is available now in most parts of the world, and February 2018 in the USA. James Hobson read history at St Catharine’s College, Cambridge, and lives in Chichester, Sussex. Now retired, he researches the social history of his specialist period, Britain in the years from 1790-1837. He also runs his successful blog “about1816”. This entry was posted in Research and tagged crime, History, Politics, social history, Writing. Bookmark the permalink.